Gurdwara Parmeshar Dwar sahib is beautiful SIKH TEMPLE located on Patiala Sangrur highway, approximately 10KM from Patiala bus stand. 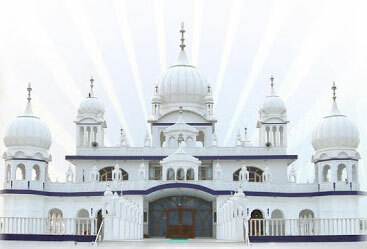 Peaceful Gurdwara Sahib building is made of white marble and amazing interiors. The premise hosts many facilities including a spacious langar hall (free kitchen) where lacs of sikh sangat and devotees are served with quality food. 'Baba Karam Singh Ji Free Charitable hospital' serves neighboring villagers with basic medical facilities for free. New Darbar Sahib building was finished in 2010. After that Kalgidhar Sangat Niwas was built. A massive diwan hall with sitting capacity over 50000 is also built where monthly Kirtan Diwan (the holy congregation) is organized. Monthly Guru Manyo Granth Chetna Samagam in organized on First Saturday of every month. Sikh devotees (Sangat) Gathers in huge number in this Kirtan Diwan. Amrit Sanchar is also held on same day. Every month in this diwan only, appx 500 people take Amrit to become Amritdhari Khalsa. This is all due to simple and straightforward preaching style of Bhai Ranjit Singh Ji Khalsa. Formerly known as Sant Baba Ranjit Singh Khalsa Dhadrianwale, Bhai Ranjit Singh Ji Khalsa was born on July 1983 in a village name Dhadrian in Sangrur District of Punjab - India. Thus being known as Dhadrian wale. He, as a child, was different from other children of his age. He had keen interest in reciting Gurbani Path and attending Sangat. When other children use to spend their vacation with their grandparents, young Ranjit Singh chose to do sewa-simran and developed deep gurmat wisdom in guidance of Sant Baba Karam Singh Ji, Sidhsar Bhiki Rara Sahib Wale. At very young age of 16, he started doing katha-kirtan and preaching of Gurmat Principals. His aim was to spread Guru Nanaks message of universal brotherhood and encourage people to live peaceful yet purposeful life. He observed that all this was possible only by adopting Sikh-Rehat Maryada, the sikh doctrine. All his preachings were aimed to encourage sikh sangat to take Amrit and spend their lives as per Gurus' word. He attended multiple diwans (congregations) every day for many years to come. He organized Amrit-Sanchar ceremonies wherever He went for preaching. People used to gather in huge number in these Diwans where they realize that there is no salvation without a true guru ( ਬਿਨ ਗੁਰ ਪੂਰੇ ਨਾਹੀ ਉਧਰ "). As on 2014, Panj-Piare (Five Beloved Sikhs) from his jatha had initiated Amrit to more than half a million sikhs (500,000) to become Amritdhari Khalsa. On one occasion in Ganganagar - Rajasthan, more that Ten Thousand (10000) people took amrit. Bhai Ranjit Singh Ji Khalsa Dhadrian wale often requests the Sangat to not to call him “Sant” or “Baba”. He want to be known as ‘brother’ instead. “We are all children of Guru gobind Singh Ji and Mata Sahib Kaur Ji” ( "ਏਕੁ ਪਿਤਾ ਏਕਸ ਕੇ ਹਮ ਬਾਰਿਕ ਤੂ ਮੇਰਾ ਗੁਰ ਹਾਈ " ) he says. Bhai Ranjit Singh is always the first to respond to anything done wrong in the community. He is the only Sikh-Preacher who is strongly against punjabi singers that to damage Punjab’s social fabric and values and distract the youth from real Grumat-values. He was first to raise voice agains Guru Grath Sahibs beadbi (sacrilege). During the protests against the Bargari Kalan sacrilege of the Guru Granth Sahib in October 2015, he sought the arrests of the perpetrators. Police attacked this peaceful protest with a Lathi-Charge where many member of his Jatha got injured. He also led a protest march of Sikh preachers to Chandigarh against the police firing at Behbal Kalan during a sit-in against the desecration incidents. Bhai Ranjit Singh's current preachings are more with emphases on enlightening inner wisdom as explained in Gurbani so that the common person in society can get rid of meaningless rituals, misconduct and drugs. He also spoke about orthodox practices being done by fake godmen in punjab. 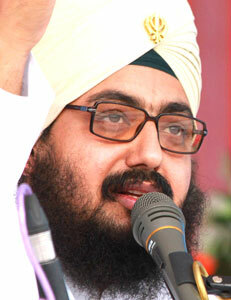 Sikh youth & sangat of all agres were equally impressed by Bhai Sahib's charismatic speaches. As a result they started to realize the true message of Gurbani is not about Karam-Kand or following any physical (deh-dhari) Guru. He urges the youth to follow the teachings of Guru Granth Sahib what is beyond and above everything else. On ther other hand the people, who are using religion as a business, have already became uncomfortable with Bhai Ranjit Singh's fearless statements. As a result a well planned attacked was made on May 17, 2016 on his car in Ludhiana to assassinate him. In this attack Bhai Ranjit Singh's preacher-friend, Bhupinder Singh Dhakkiwale, was shot dead. Dhadrian Wale, from that moment, has been demanding for justice for Bhai Bhupinder Singh's family. May Guru Sahib keep Bhai Sahib in everlasting Chardi-Kala.